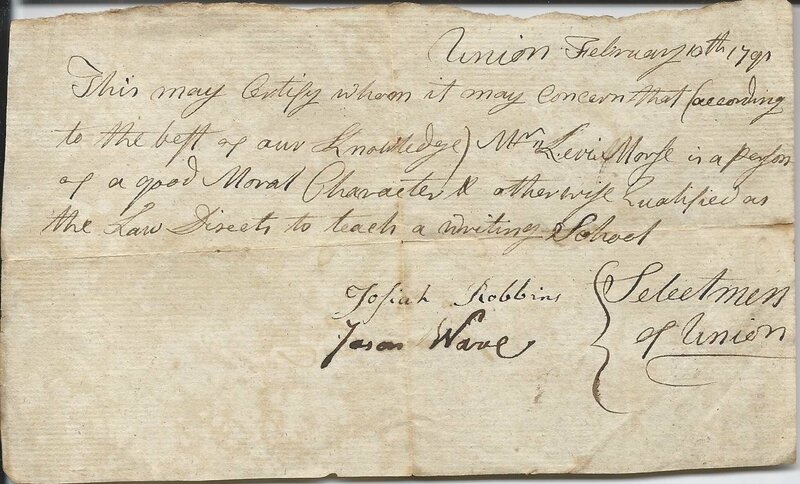 1791 document attesting that Union, Maine selectmen Josiah Robbins and Jason Ware believed Mr. Levi Morse qualified to teach a writing school. Josiah Robbins was born 23 July 1737 at Walpole, Massachusetts, the son of Ebenezer and Experience (Holmes) Robbins. His paternal grandparents were William and Priscilla Robbins. His maternal grandparents were John and Hannah (Newell) Holmes. On 26 July 1765 at Massachusetts, Josiah Robbins married Sarah Smith, daughter of Matthew and Sarah (Adams) Smith. She was born 24 April 1746 in Norfolk County, Massachusetts. I believe they raised six children at Union, Maine. Josiah Robbins died 5 January 1811 at Union. 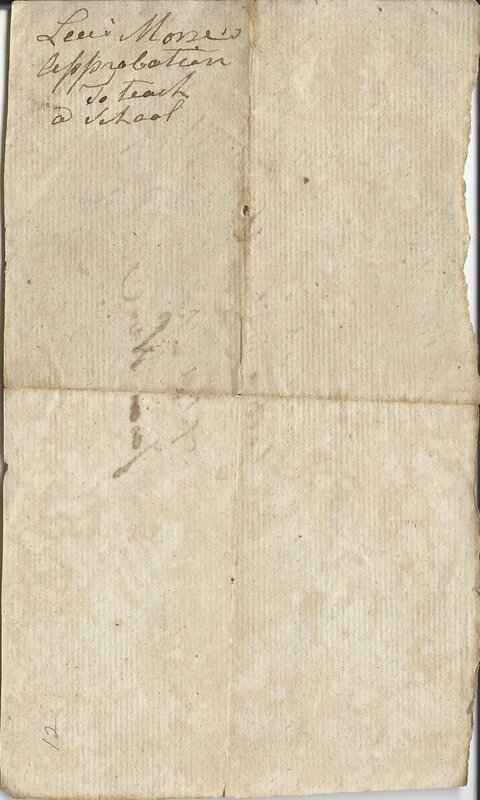 Sarah (Smith) Robbins died 27 February 1826 at Union. Jason Ware was born 10 March 1756 at Wrentham, Massachusetts, the son of Jabez and Mary (Mann) Ware. His paternal grandparents were Michael and Jane or Jean (Wight) Ware. His maternal grandparents were Thomas and Hannah (Aldis) Mann. On 16 September 1782 at Union, Maine, Jason Ware married Mary Polly Peabody, daughter of Stephen and Ruth (Storer) Peabody. They raised, I believe, eight children. Polly (Peabody) Ware died 5 March 1815 at Union, Maine. Jason Ware married Sally Severence at Union, Maine, in 1817. Jason died at Union, Maine on 11 May 1843. Levi Morse was born 5 January 1762 at Natick or Sherborn, Massachusetts, son of Obadiah and Grace (Fairbanks) Morse. His paternal grandparents were Obadiah and Mercy Mary (Walker) Morse. His maternal grandparents were Jonathan and Hannah (Coolidge) Fairbanks. On 1 March 1792 at Granville, Nova Scotia, Levi married Mary Polly Gay Bradford, daughter of Carpenter and Mary (Gay) Bradford. They lived at Union, Maine, and raised a family of, I believe, thirteen children. If you have any corrections to the information above or if you feel that the men noted in the document were other people, please leave a comment or contact me directly.